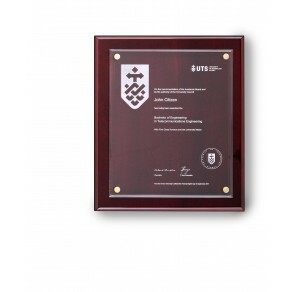 Plaques are a fantastic way to display your achievements. 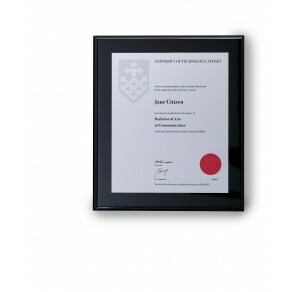 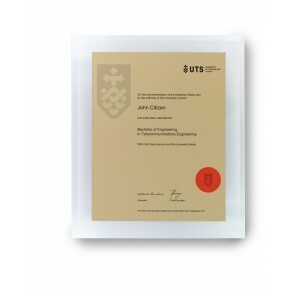 Some graduates like to replicate their degree in plaque form, either to preserve the original or as a keepsake for a friend or family member who offered support throughout their studies. 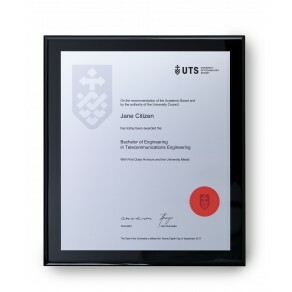 All plaques come with a desk or shelf stand, as well as quality hooks for hanging. 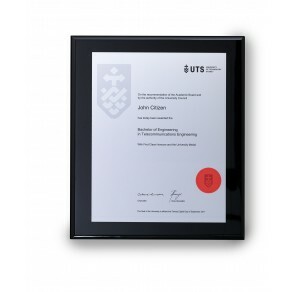 We offer 3 sizes : Large (34.5cm x 39.5cm), Medium (30cm x 35cm) and Small (26cm x 30cm). 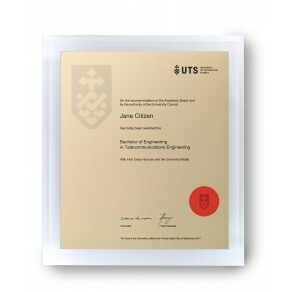 UTS Acrylic on Rosewood Small Plaque (26cm x 30cm) ..
UTS Gold on Black Large Plaque (34.5cm x 39.5cm) ..
UTS Gold on Black Medium Plaque (30cm x 35cm) ..
UTS Gold on Black Small Plaque (26cm x 30cm) ..
UTS Gold on Clear Acrylic Medium Plaque (30cm x 35cm) ..
UTS Gold on Clear Arcrylic Large Plaque (34.5cm x 39.5cm) ..
UTS Gold on Matt Black Large Plaque (34.5cm x 39.5cm) ..
UTS Gold on Matt Black Medium Plaque (30cm x 35cm) ..
UTS Gold on Matt Black Small Plaque (26cm x 30cm) ..
UTS Gold on Rosewood Large Plaque (34.5cm x 39.5cm) ..
UTS Gold on Rosewood Medium Plaque (30cm x 35cm) ..
UTS Gold on Rosewood Small Plaque (26cm x 30cm) ..
UTS Silver on Black Large Plaque (34.5cm x 39.5cm) ..
UTS Silver on Black Medium Plaque (30cm x 35cm) ..
UTS Silver on Black Small Plaque (26cm x 30cm) ..